The market has some interesting dance moves, bouncing and stomping around. Market premium is no more. The SP500 got wasted, and has has decline about 4% from its high. Fear is at levels suggesting a bottoming. Along with the SP500 being at the 123sma support, and the NYSE Composite is at supports too. A steady decline on the Vix from the end-of-world days justifies the lower fear level. 1. Currency declines support economies (although the US is doing pretty well with a stronger currency. Non-the-less, the treasury decided the above merits the opposite. 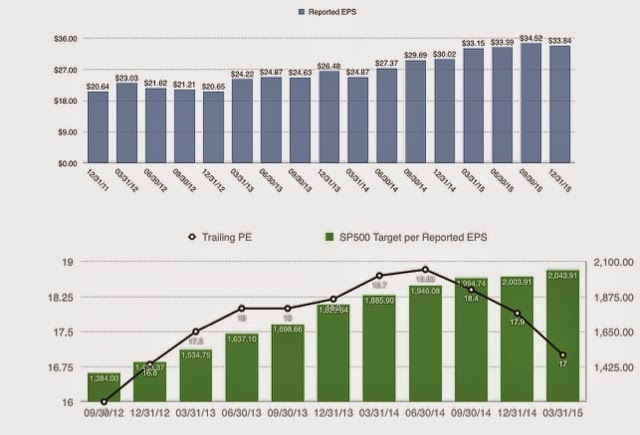 SP500 earnings estimates are holding steady. (They were revised up slightly.) if estimates hold, the equity markets can sustain a complete premium removal without causing too much damage to the SP500. Markets look to have started the new trading dynamic. The multiple is no longer expanding, and trading range is no longer widing. It's October. Lliking the market is hard, but it looks juicy. Have a beer, enjoy the festivities, look for the opportunities to start dancing again.